Chasing Furies is a sibling group made up of Sarah Meeker, age 22, the group's chief songwriter and vocalist, older brother Joshua, age 24, the band's lead guitarist who also writes and sings, and younger sister Rachel, age 18, who also sings. 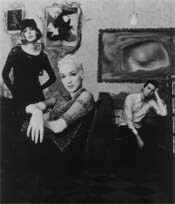 The three have been playing music all their lives, but the band really began to gel when Sarah discovered songwriting. "Josh had always been the writer in the family, and I had always just sang backup for him," recalls Sarah. "When I started writing, I felt silly; I had just learned to play the guitar so I could write songs, and here Josh is this phenomenal guitarist." Embarrassed to showcase her fledgling efforts before the entire family, Sarah asked younger sister Rachel to sing back-up at a local coffee house open mic night. Both were encouraged by the overwhelmingly positive response, and asked Josh to join them for a return engagement. And so Chasing Furies was born. Their debut album is entitled With Abandon. Comments on Chasing Furies: one of the most musically creative Christian bands I've come across. Their lyrics are poetic and searching, baring the soul. The songs seem to circle around themes of the pain of living in this world and the struggle to be understood by others, countered with the pure ecstasy and joy of having hope in Jesus. This album is a beautiful work of art, and as it is largely introspective, moves the listener to look closer into his or her own faith. 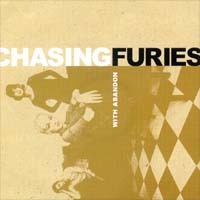 Fans of Chasing Furies rave of the band's amazingly beautiful harmonies, hearfelt and honest lyrics, and unique and bold sound on this, their only CD. Thirty-one reviews on amazon.com average 4 1/2 stars, and many of the reviewers say they wish more had heard this incredibly talented group.